With the prices of graphics cards rising due to the cryptocurrency gold rush, it’s now more sensible to buy a pre-built device for mining cryptocurrencies, which is where our best mining rig 2018 list comes in. Unlike the best mining desktop PCs, which can be used for other day-to-day tasks as normal PCs, mining rigs are specially-designed for one purpose only: to efficiently and effectively mine cryptocurrencies such as Bitcoin. This means you won’t be able to use a mining rig for other tasks, but it does mean you’ll be getting the very best mining results thanks to the best mining rigs being designed to eke out the maximum return when running. If you still want to build your own mining rig, check out our guides on the best mining GPUs, best mining CPU, best mining motherboards and best mining SSDsto help you get started. 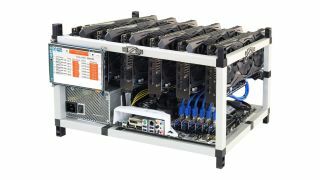 Shark Mining is a well-regarded company that makes some excellent pre-built mining rigs. Its Shark Mini is a compact rig that comes with four GPUs. The base model comes with GTX 1070 GPUs, but your can configure it to have a 1070 Ti GPU, which could net you an extra 10% profit, and you can also add a touchscreen display for keeping an eye on the rig. Shark Mining estimates a profit of $600 a month if you mine ZCash or Bitcoin, and up to $400 a month with Ethereum, though of course that could change. Shark Mining has another entry in this list of best mining rigs, this time with its Shark PRO mining rig. Like the Shark mini, this is a well-built device for mining that comes with a range of configuration options. The base model comes with six GTX 1070 cards, but these can be upgraded to GTX 1070 Ti or GTX 1080 Ti GPUs. It’s an expensive rig, but the build quality and potential profit makes it a very tempting choice if you’re serious about mining.